Climate scientists were startled by the two destructive storms occurring so close together and speculated whether they were a worrying sign of a “new normal” in which extreme weather events become more intense as a result of man-made climate change. Two so close together? They must have asked chemists what they thought of tropical storms; climate scientists know this stuff. This is the hurricane season, and they often come thick and fast while the water is so warm, that’s what drives them. But this writer fails to tell us that for the last twelve years there’s been a hurricane drought. No major hurricane has come ashore in the US for twelve years, an unprecedented lull that rebuts claims of more and more storms driven by man-made climate change. Anyway, there were actually three storms happening together, see? Irma was approaching Florida as Katia reached Mexico, and further out to sea was Jose, right now strengthening and turning north away from the Bahamas. This was not a unique occurrence. Three tropical storms arrive together about once every ten years, a predictable result of clear climate patterns, experts say. “Hurricanes aren’t really a random phenomenon. They need conditions that are very conducive in order to form,” said Gerry Bell, a lead seasonal hurricane forecaster with the National Oceanic and Atmospheric Administration’s (NOAA) Climate Prediction Center. The Herald leader writer was wrong again, but presses on. What is indisputable is the physics: the storms packed punch because water surface temperatures in the region are high. Hurricanes draw energy and moisture from ocean heat. What is less clear is the extent to which rising greenhouse gas emissions are driving the extreme weather. It’s not only less clear, it’s clouded to the point of murky. 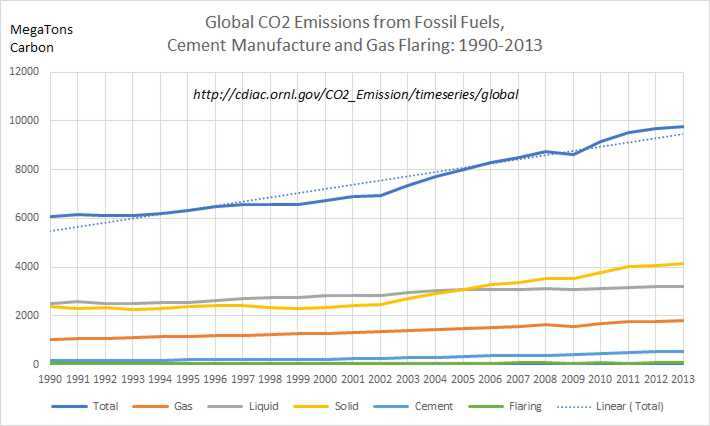 But note another insinuation that rising emissions really are at work here – we’re just not sure how much. The truth is they cannot say that our emissions are having an effect. They’re just guessing. Apparently, although “the scientists” aren’t entirely sure about the extent to which our emissions affect the “extreme weather”, they actually know we do affect it after all, because they agree governments must “urgently” reduce emissions and prepare for a warmer future and more disasters. So, what’s that evidence, again? Then we have an extraordinary assertion. US experts have produced a report which the White House is sitting on. It concludes that evidence for climate change abounds, “from the top of the atmosphere to the depths of the ocean”. The study reports that it is possible to attribute some extreme weather to climate change through the work of experts in the field known as “attribution science” which itself has advanced rapidly in response to events such as heat waves, intense rainstorms and coral reef destruction. Amazing. Like casting chicken innards on the ground and reading them. Attribution, no matter how they try to spin it, is the act of saying this thing was caused by that thing. It’s a human act, not a computer program, and an art, not a science. So yes, it’s possible to “attribute some extreme weather to climate change“. Of course it is. All you do is announce it. But saying it’s been attributed doesn’t mean it’s true. This runs counter to claims by the Trump administration which take the view that the human contribution to climate change is uncertain, and that the ability to predict the effects is limited. But, ironically, this is precisely what the IPCC says in every one of its reports. Amazing, that the Herald can accuse the Trump government of acting like IPCC scientists. Is that an honour or an insult? Finally, the Herald refers to the Ministry for the Environment risk assessment report guide for local body coastal planning, quoting it on sea level rise. Sea level rise is the most savage of the climate change monsters we’re threatened with, but its legs are as shaky as those of all the other monsters. I’ll point out there’s been no increase in the steady rate of sea level rise for about a hundred years, so it had better get a move on or it’ll be late for its own catastrophe. Lastly, the doomsayers mostly use the IPCC’s most extreme scenario for these visions of apocalypse, and a brief examination will show that that scenario is unlikely to the point of magical. I’ve run out of time to find the data I need, but you can have this and I’ll revisit the sea level matter shortly. Once again you are comparing two things that are not the same. The table that you reference is continental US hurricane landfall not mid-Atlantic maximums. The continental US was spared the worst of Irma. I don’t always agree with Herald editorials but this one is accurate. The dishonesty lies elsewhere. 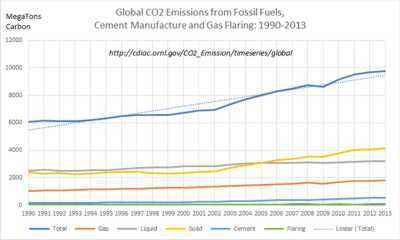 A linear increase in emissions is an increase in emissions. What are you trying to say? Don’t make me laugh. He knows nothing. Your link to ecowatch is hollow and says nothing about the observations or the science. Once again you are comparing two things that are not the same. 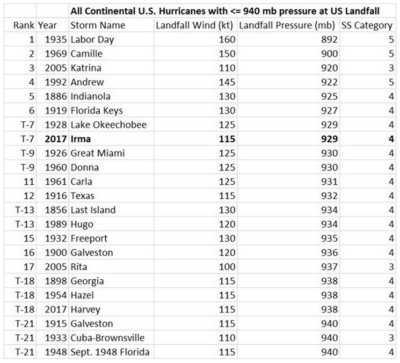 The table that you reference is continental US hurricane landfall not mid-Atlantic maximums. The term “mid-Atlantic” is variously defined, but it certainly doesn’t mean “with 500 miles of seaway on every side”, for it would be ridiculous to attempt to compare hurricanes we could not observe. it’s intended longitudinally, not latitudinally and in all sensible conversations would include all landfalling hurricanes. But, more pertinently, the table I cite is of landfalling hurricanes, sorted by magnitude. All of those started in the mid-Atlantic. What more do you want? Oh, wait. The continental US was spared the worst of Irma. So you say. It still landed on it, so it’s on the list. What are you saying? If that’s the best you can dredge up to dispute, I’d say our opposition is mortally wounded. What do you think about the Herald’s point about two storms “so close together” and a “worrying sign” of a new normal? Alarming, isn’t it? Alarming that their reasoning is so shallow. P.S., Kindly answer my previous questions. Stop being a waste of space. Yes, it’s an increase, but I was trying to say that the increase over the last few years may have declined, as you can readily confirm from the last four years of the graph. Don’t turn the linear trend into a linear increase, it’s only a line drawn with a ruler. Also, the data ended four years ago. We cannot be sure emissions have increased much for the last eight years. I think the whole MSM has cast aside logic and sensible analysis. Seems that NZ has finally surpassed the Cost of the 1968 Wahine Storm year. but if we look back at the Insurance Council payouts over the last few years, we don’t see this pattern of increasing costs year after year. Finally, good old RNZ puts in a clip from a resident (Lynda Lester) of Wellington’s South Coast… she has lived there for 5 years and from her accent clearly isn’t a local. She assures us that the storms are getting worse… debris is thrown across the coast onto the road. If the last 5 years is all she has to reference, I can assure her, she ain’t seen much yet. I also heard this rubbish this morning.I did post this a few days ago on another topic. I visited Oterongo Bay a few days after the Wahine storm. This is where the Cook Strait cables come ashore on the South Coast west of Wellington The wind speed and direction were recorded by two needles on a revolving paper drum. The traces ceased abruptly at 164 mph as at that stage the sensor was blown away. The peak speed is unknown. That was the day before Irma hit and I thought that was pretty benign, it looked typical of a day’s kiting on NZ’s West Coast. Wind was probably only 25-30 knots. I assume he left before any squalls hit and found appropriate shelter.